Erica Clarke is the Communications Coordinator at the New Braunfels Chamber of Commerce. She grew up in Spring Branch and graduated from Smithson Valley High School. Clarke attended Texas State University where she received her Bachelor’s Degree in Mass Communications – Public Relations with a minor in psychology. She is an Alpha Xi Delta alumnae. Her first job out of college was at Dickson Productions Inc. helping produce the MusicFest in Steamboat Springs, Colorado and Rio Frio Fest in Concan, Texas. After almost two years with Dickson Productions, Clarke decided to branch out and joined the Chamber in April of 2018. 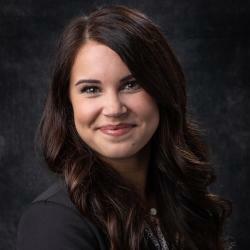 Her role at the Chamber is to coordinate the weekly e-newsletter, social media, website content, press releases, communications schedule and much more. Clarke consumes Chick-fil-A, Netflix, and wine with equal ferocity. When she’s not working, she can be found hiking, traveling, or doing something outdoors. She lives with her beloved mutt, Bailey, and tolerated cat, Max, in downtown New Braunfels. Clarke will likely stop the car if she is driving by a field of cows in order to snap a quick picture. She also writes a blog in her spare time about dating, relationships and Jesus. Favorite flavor of ice cream? I recently had Bailey’s Salted Caramel ice cream from Tipsy Cow and wow. That is some good eating. If you could time travel, what time period would you visit first? I would really like to travel back about 40 years. I’ve given the same answer to this questions for many years now. I would love to meet my dad’s mother. She passed away when I was two years old, and from the stories I’ve heard, she was an incredible woman. Favorite all time musician or band? How do you pick ONE? My taste in music is all across the board, from Stevie Ray Vaughn to Chris Stapleton, William Clark Green to Tom Petty, Lake Street Drive to the Temptations, and Whiskey Myers to ZZ Top. I am a huge fan of Classic Rock (thanks, dad) and Texas Country. My mom gave me a lot of love for 80’s jams, too.